Andie Brown is a musician, artist, maker and researcher who began her music career as a bass player during her teens. In 2007 Andie began performing and recording as a solo artist under the name These Feathers Have Plumes. 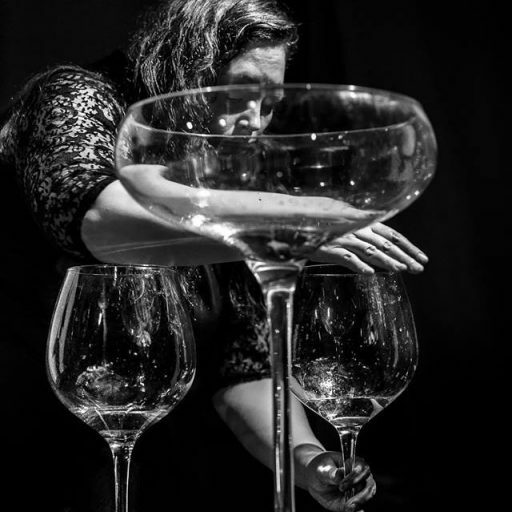 Over the last decade, Andie has been experimenting with glass and electronics, creating what she has termed an “augmented glass harp”. Andie has performed extensively including at Colour Out of Space and Full of Noises Festivals and at venues such as Cafe OTO, Union Chapel and the De La Warr Pavilion. She has also taken part in ensemble works with Part Wild Horses Mane on Both Sides at Tate Britain and at White Cube Gallery for Christian Marclay conducted by Steve Beresford. Elsewhere, Andie has enjoyed collaborating with a diverse range of artists including Sophie Cooper, Joincey, Kelly Jayne Jones, Dale Cornish and Phil Julian but most often with artist and vocalist Sharon Gal. Since 2016 Andie has also been working with sound installation and film; in 2017, Andie was nominated for the PRSF Oram Awards and began a practiced based PhD at the University of Huddersfield. Andie is also a co-Director at Yorkshire Sound Women Network.